Beyond their sparkle, gemstones always have an interesting history. 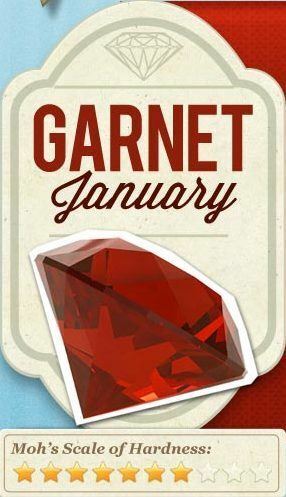 January’s gem, the garnet, perfectly illustrates this. Capricorns have the garnet as their birthstone, which symbolizes faith, truth, and constancy. It was only in 1912 that the American National Association of Jewelers declared the garnet to be the officially January birthstone. Garnets in jewelry have been discovered in prehistoric graves, circa 3000 BC. They were already in existence in 2100 BC Sumeria, were used to represent the sun in Spanish astrology, and to engrave the portraits of early Romans. Ancient African tribal elders, Aztecs, Mayans, Native American Indians, and South American Indians considered them sacred. Many religions consider the garnet an important symbol. For instance, there is mention in the Islamic Koran of how it illuminates the Fourth Heaven. A blood-red garnet symbolizes Christ’s sacrifice for Christians. In Hebrew texts, a garnet is said to be included in Aaron’s breastplate. There is also a legend of how Noah used a glowing garnet to illuminate his ark during storms and dark nights. Though readily recognizable in their fiery red form, there are actually different colored garnets in existence: deep red, orange, yellow, green, purple, pink, brown, black, and even colorless ones. The price of a garnet per carat depends on its type and color, with the green-bearing chromium garnet called the Uvarovite being one of the rarest. Aside from jewelry, this precious gem also has industrial uses. There is something called a garnet paper, which cabinet-makers and fine furniture craftsmen use to finish bare wood. Garnet sand has also replaced silica in sand-blasting. It is also widely used in water filtration systems, and has been known to cut steel in water jets when mixed with the proper media. There is a lot to know about the January birthstone which will make one realize how precious it really is. Brilliance.com has come up with an infographic for the new year which is fittingly all about the garnet. Learn more about this amazing birthstone now.